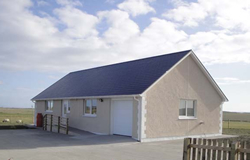 North Uist with its many white sandy beaches and turquoise seas is an idyllic holiday getaway whether you are looking for a relaxing chilled out holiday or to use it as a base for your outdoor pursuits ie walking, windsurfing, canoeing, cycling, fishing, diving, bird watching, island hopping etc. Facilities include Satellite Broadband with Wi-Fi, Freesat TV (Lounge) Freeview TV (in both Bedrooms) Blue-ray/DVD Player, Telescope, Under Floor Heating and Heated Towel Radiators in the En Suite and Bathroom, Ample Parking, Integral Garage (with Remote Control Opening), Patio Area with BBQ and Furniture, Enclosed Garden, Drying Area, Gas Hob, Electric Double Oven, Dishwasher, Fridge Freezer, Microwave, Kettle, Toaster, Slow Cooker, Toasted Sandwich Maker, Iron and Ironing board, Vacuum Cleaner, Washing Machine and Tumble Dryer, (situated in Garage). Prices are Inclusive of all Bed Linen. It is available to rent all year round and is designed to accommodate a max of 4 persons.